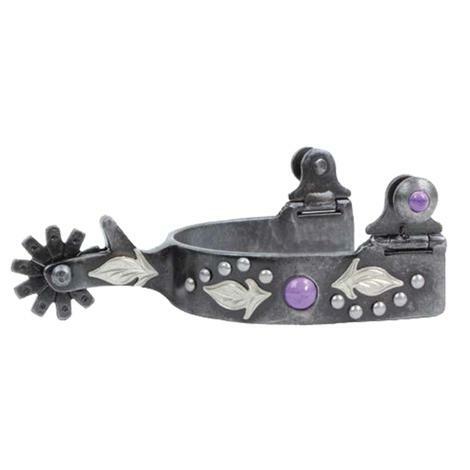 This spur features a unique silver feather with silver dots and a purple stone centerpiece. Get yours today while supplies last! The 1” band on this spur by is weighted to stay down on the heel. Grey iron color. Polished steel spur with a chap guard and a 12 point rowel. The shank and rowel measure 2 ¼ inches. The boot width is 2 ¾ inches and the band is ¾ of an inch. The rowel is a blunted style and has 12 points. 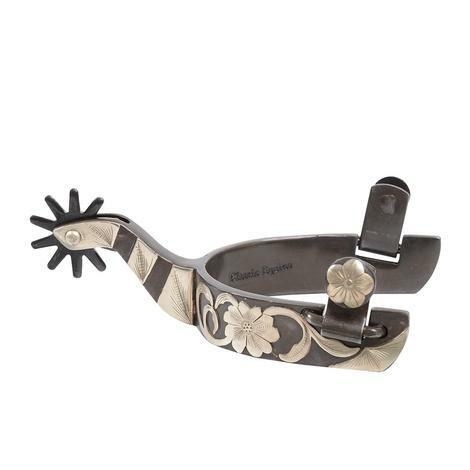 This spur is part of the Brittany Pozzi collection made by Professional’s Choice. This is a youth spur with ½ inch band and 1 ¼ inch shank. The spurs are made of greyed iron. The trim is hand engraved German silver. Includes scroll on the band, scroll on the shank, and floral buttons. 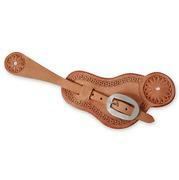 Spur strap made from chestnut skirting leather. The leather is stitched and tooled. The tooling is Alpine Floral. 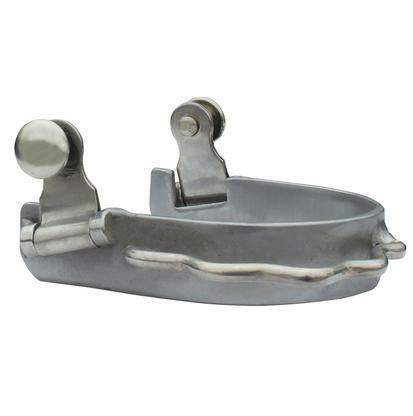 A stainless steel buckle allows you to adapt the fit with 5 sizing options. Professional’s Choice floral shank spur with a 10 point rowel. 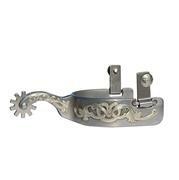 This spur is made from polished steel and has German silver floral trim. The band is ¾ of an inch, the shank is 1 inch, and the boot width is 2 ½ inches. The rowel is small, has 10 points, and is blunted. This spur features floral trim and a bumper. The floral trim is engraved and includes a floral design on the button. The band is ¾ of an inch and the boot width is 2 ½ inches. 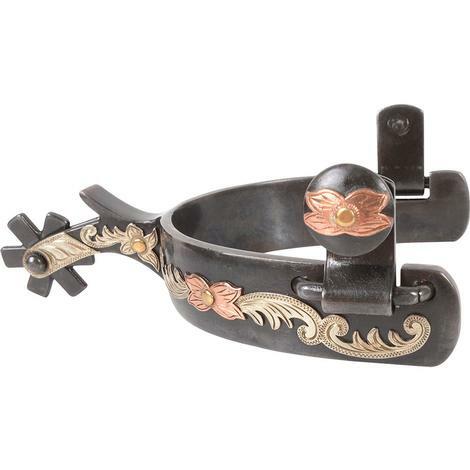 The Floral Bumper Spur is made by Professional’s Choice. 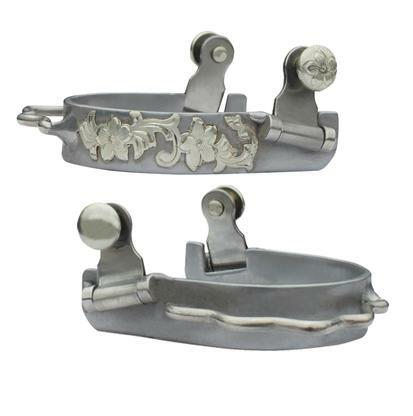 Medium spurs featuring engraved floral trim with an updated modern flare. 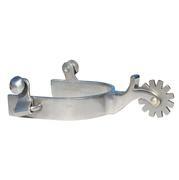 The spur band is 1 inch, the shank and rowel are 2 ½ inches, and the rowel is 10 points. 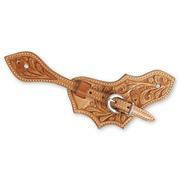 This spur has a blunted rowel. The finish is polished steel. 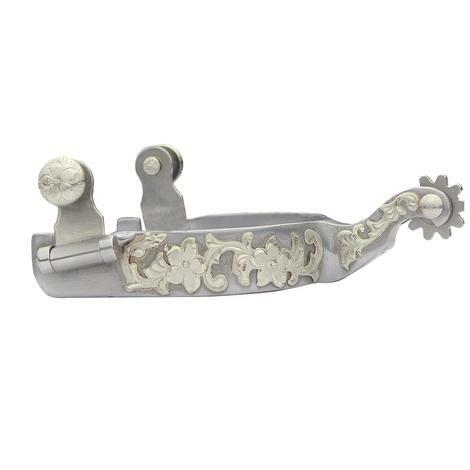 This is a versatile spur made by Professional’s Choice as part of the Bob Avila collection. Martin Saddlery spur strap made from chocolate roughout leather. 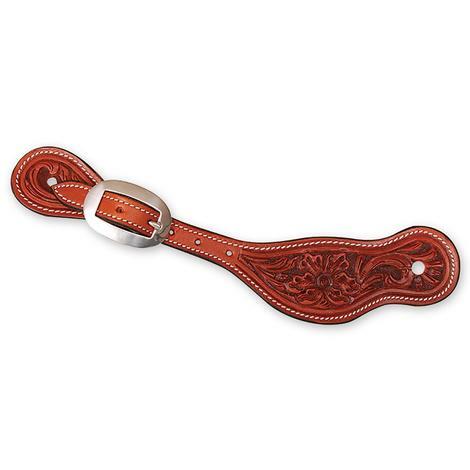 The buckaroo spur strap has a stainless steel buckle and a san carlos border. 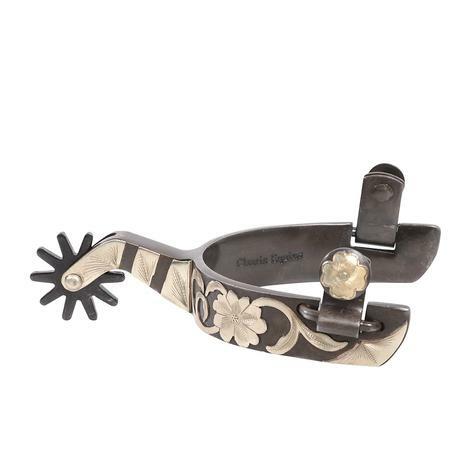 Natural roughout leather buckaroo spur strap with carlos border and stainless steel buckle. Fully adjustable spur strap with stainless steel buckles. This is an oak leaf style spur strap made from natural skirting leather with acorn oak tooling. 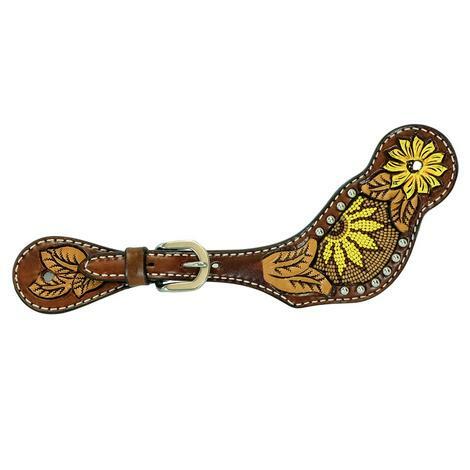 Rafter T Ranch beaded inlay in sunflower pattern spur straps are available now at South Texas Tack. Each pair are hand tooled in contrasting tan and chestnut leather with beaded sunflower patterned inlay and silver stud outline. Three hole and stainless steel buckle adjustment. Matching tack is available in this pattern. 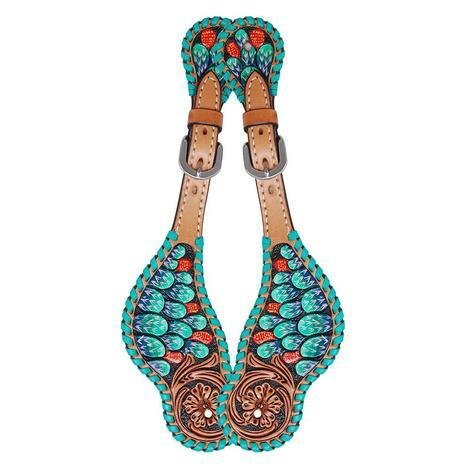 Rafter T Ranch gem studded Zuni turquoise flower pattern spur straps are available now at South Texas Tack. Each pair are hand tooled in contrasting tan and chestnut leather with hand painted zuni flower patterned inlay and crystal gem outline. Three hole and stainless steel buckle adjustment. Matching tack is available in this pattern. These adorible spur straps feature panted cactus for a southern feel. Sized for youth. Classic Equine Women's Small Copper Silver Flower Greyed Iron Spur 1"
This Classic Equine flower series spur has very decorative copper flower detail on a grey iron 1" spur band. This spur has a 2" shank as well as a 6 point rowel with a chap guard. 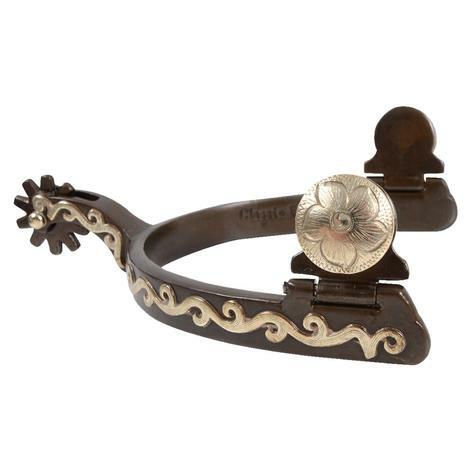 Classic Equine Small Copper Silver Flower Greyed Iron Spur 1"
Classic Equine Copper Silver Floral Spur with Chap Guard 1.25"
This beauty is a brushed iron featuring a silver and copper floral design. 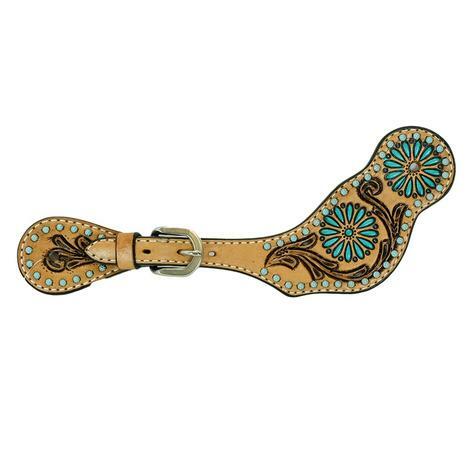 Looking for a new pair of spur straps? Then look no further these are the perfect ones. This pair of star stitched dark oiled spur straps have the right amount of design and color. These straps measure 10 3/4" from end to end and are 2 1/2" wide at the largest part. 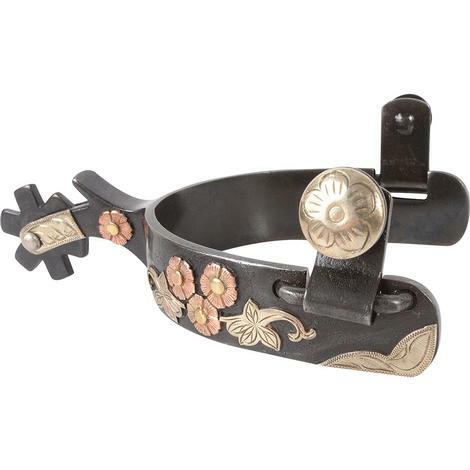 The buckle is brown with copper floral design and is 2" long. Looking for a new pair of spur straps? Then look no further these are the perfect ones. 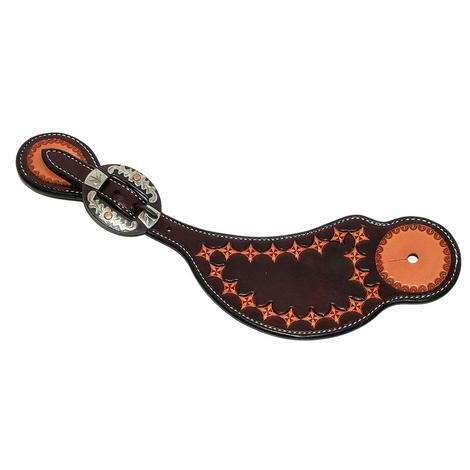 This pair of star stitched dark oiled spur straps have the right amount of design and color. These straps measure 10 3/4" from end to end and are 2 1/2" wide at the largest part. 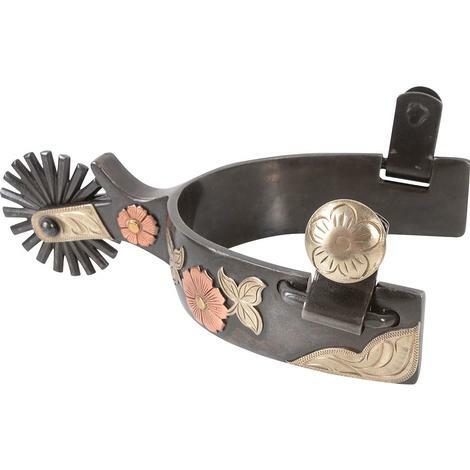 The buckle is silver with copper floral design and is 2" long.